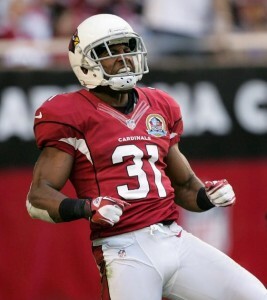 Justin Bethel is a 3x Pro Bowler with the Arizona Cardinals where he is entering his 6th NFL season as a defensive back. He reached Pro Bowl honors three of his first four NFL seasons. Bethel was drafted in the 6th round of the 2012 draft from Presbyterian College. Justin’s talent caught the attention of NFL scouts with a stellar performance at the East-West Shrine Game and because of a YouTube video showing him make a 60″ vertical box jump flat-footed. His vertical leap also measured the highest at the NFL combine by any defensive player. Bethel is considered the best special teams player in the NFL according to Pro Bowl Focus. A native of Columbia, South Carolina Justin attended Bythewood High School where he won a state championship in 2006. In 2015, Bythewood High School retired his jersey, number 31.